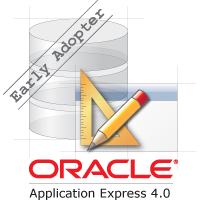 APEX 4.0 Early Adopter now available! The APEX Development Team is proud to present the Early Adopter for APEX 4.0. Please fill out the survey and request a workspace on our hosted instance @ http://tryapexnow.com. This Early Adopter is not production ready and some new features may contain bugs or incomplete functionality. Websheets is not yet available in the Early Adopter. Our plan is to produce an updated release (Early Adopter Phase II) once Websheets is ready to be tested. The new theme used throughout the Application Builder is still a work in progress, especially in respect to Internet Explorer. Therefore we have disabled access from IE at this stage. Online Help has not yet been updated and does not include any new features. An application describing all the new features will be available shortly. Please provide feedback directly from within the Application Builder.